The color of a bead can be used to tell a story about the bead itself. Just like beads have special characteristics so do the colors used on and within the beads. The ability to classify and communicate a color easily allows for a greater understanding of the bead. The coloring of a bead can be used to indicate the region of the world that the bead is from and the types of materials used in the creation of the bead. By providing a coherent set of comparison colors in use throughout the field, the charts enable beads, from one archaeological site or beaded object, to be accurately compared to beads found at another site or on a different object. 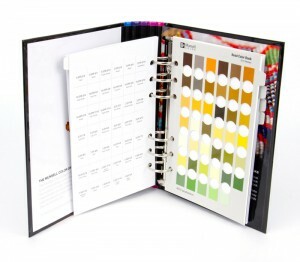 The Bead Color Charts with 176 of the most likely colors, offer a more portable solution to determining bead colors in the field, enabling you to rapidly zero in on color matches. Providing an obvious benefit even if your organization has the full Munsell Book of Color.